The gift of bespoke directly to a person of your choice. For the ultimate gift, what could be better than the experience of having a beautifully hand crafted, bespoke garment made? 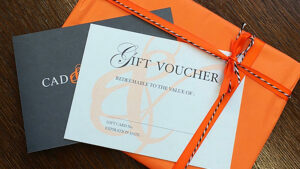 This stylish gift voucher entitles the receiver to a bespoke jacket. They will be guided through the entire process by one of our expert tailors who will assist them in all of the choices, styles and fabrics available, allowing us to create the perfect garment for them.Read our gift voucher terms & conditions. We have two types of voucher available. This is a physical voucher, handwritten and sent to the address of your choice and is only redeemable in store. We also offer a digital voucher which is only redeemable online for accessories and can be emailed to an address of your choice.